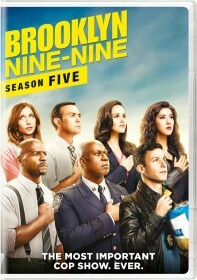 FOX has issued the press release for the November 21 episode of Brooklyn Nine-Nine, "Two Turkeys". Bradley Whitford (The West Wing), Katey Sagal (Married with Children), Jimmy Smits (24: Legacy), and Bertila Damas (Grimm) guest star. Jake and Amy attempt to get their parents to bond over Thanksgiving dinner, but their first holiday together as a family does not go well. Meanwhile, at the precinct, Holt and Kevin's special Thanksgiving pie is stolen from his office and Holt searches through the ranks for the possible culprit in the all-new "Two Turkeys" episode of BROOKLYN NINE-NINE airing Tuesday, Nov. 21 (9:30-10:00 PM ET/PT) on FOX.